Simple bookkeeping in Excel. This free template was created for startups, freelancers and small business owners. Upon downloading you agree to our disclaimer. 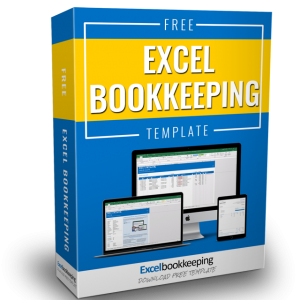 This free Excel bookkeeping template is easy-to-understand, simple-to-use and completely free. 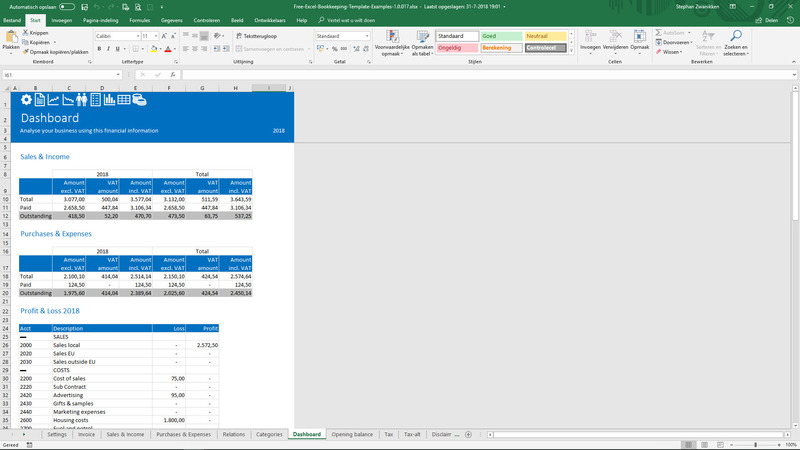 I have used the Excel bookkeeping template for a few weeks now and I am amazed at its simplicity. Ideal for a self-employed or small company. You don't have to have much knowledge of accounting. 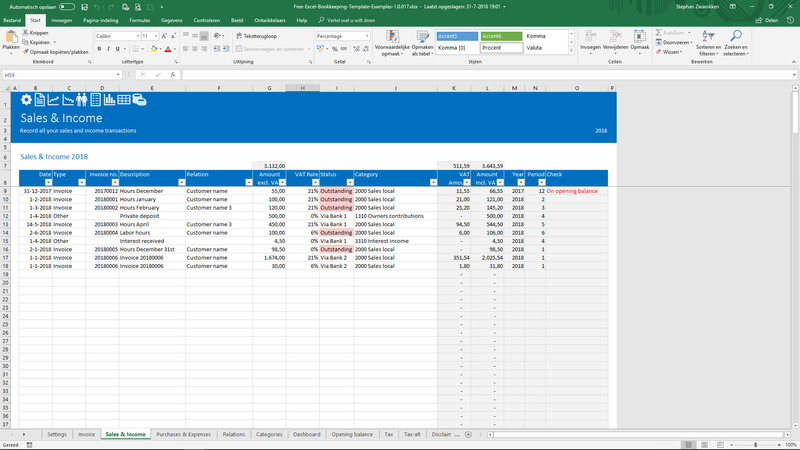 I am used to the extensive package of the Excel Accounting Template that has a lot more possibilities, but this bookkeeping template certainly does its job. Fine addition to what the accounting world has to offer. 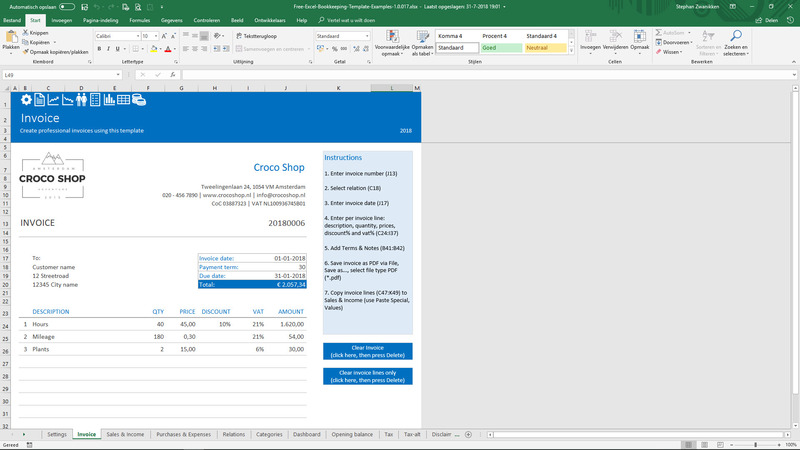 With this free Excel bookkeeping template you can create beautiful invoices in seconds. All you have to do is fill out a predefined invoice template. Just fill in the blanks, such as: invoice number, invoice date, customer, products & services sold etcetera. You can change the logo or make any adjustment to the invoice to fit your needs. For instance, change colors, fonts, column widths and or add extra text to clarify sales terms. All sales & income and purchases & expenses transactions are recorded in simple tables. Don't worry. Even a 10-year old can do this. All you have to do is input the date, transaction type and a description of the products and services sold or bought. Then, you select a relation (customer/supplier). Now, you enter the amount excluding VAT and the applicable VAT rate. VAT is automatically calculated. Finally, you state whether the invoice is still ‘Outstanding’ or has already been paid via Bank or Cash. The balance sheet and the profit & loss statement are automatically generated. Amounts are totalled per category. You see in a glance if you made a profit or not. The dashboard also contains totals of all sales and purchases made for both the current year as well as all years. Extremely suitable for the starting entrepreneur or freelancer if you only have a limited amount of transactions. The basic template can conveniently be changed to fit your organization specific situation. Simply record all your sales and income transactions in an ordinary table. Just fill out a few cells and you are done! Creating good looking invoices has never been easier. Fill in the blanks and your invoice is done! The dashboard provides you with critical information such as the Profit & Loss Statement and Balance Sheet.